An ebook that I have been preparing for a loooong time, painstakingly collecting steps of art tiles I have created! This ebook is completely different than my previous ones: instead of straight technique, take a "peek over my shoulder" and follow my shading process each step of the way. This is an INTERMEDIATE level ebook, for someone who has already done some basic amount of Zentangle shading. If you are just starting, then get my ebook Shading Fearlessly here. This ebook has 15 examples. If you are just starting to shade Zentangle®, ZIA and doodles, then consider getting my ebook Shading Fearlessly first! 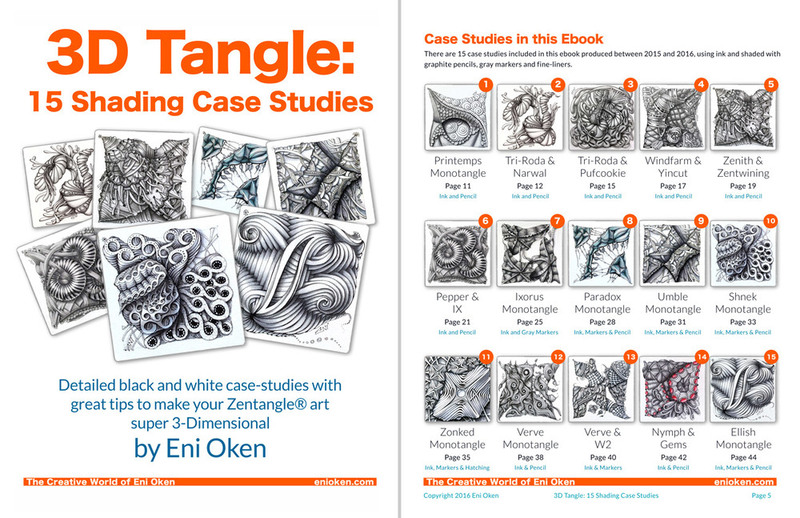 In her latest book, “3D Tangle: Shading Case Studies", Eni shares more of her knowledge of dimensional shading. Many of the techniques in this book have been developed by Eni over 28 years of art exploration. Whether you are just starting your shading journey, or are an experienced tangle artist, this book is full of tips to compliment your art. Beautifully illustrated drawings, reinforced by easily understood directions, will make this your go to shading tool. Eni shares here knowledge of different shading techniques using pencil, pen, markers, or a combination of these tools.Within the 15 case studies presented in her ebook, you will learn how to enhance your drawings, making them appear to jump off the page.If you have ever found yourself lost in a “how to book”, you will be amazed at the ease of use this book provides.The illustrations in this book are in themselves a work of art. The thing I was most impressed with was the illustrations and written explanations. I am a visual learning, so the illustrations are great for me, but when you add the written directions to correspond with the pictures, it is perfection. This book is for any kind of "learner". If you are looking for that perfect book to take you to another level, this book surpasses anything I have found on how to shade fearlessly in 3D. Just wanted to say thanks for the great e-book. I haven't drawn much in over 25 years and was feeling really overwhelmed though I used to be quite good. Just reading your book started bringing it all back. Now I think I can tangle with this tangle and not feel so lost. Just wanted to let you know, I really appreciate your clear concise instructions. Wonderful reference book! Thanks, Eni! Your books have made such a difference in my Zentangle journey. Looks great! Lots of great tips and I like 'watching' the tangles progress. It reinforces the steps that work with any pattern by helping you to visualize how you start and move through to the end. The fantastic Sandra Strait (AKA Molossus) also gave me a review of the book, read it here!